Friedrichshain, historically one of the most punk hoods in Berlin, where you can still find a lot of project housing and see pink or blue crests, is now becoming the place to be in Berlin. Many companies are setting up shop in the area, alongside many new home construction, together with new hotels, restaurant openings and of course cafes. Friedrichshain is now the highlight in Berlin, so where do you go if you want to have a nice breakfast in the so called Fshain? Named after the famous Budapest pub, the Berlin version is a pearl situated in the very heart of Friedrichshain, on the corner of Boxhagener Platz. You can easily go on a Sunday, first to tour one of the most famous and best flea markets in town and then to have very nice brunch at Szimpla. Or the way around, depends how hungry you are. From coffee to beers to cocktails you can find everything you need. My favourite breakfast is the salmon one, simply delicious! 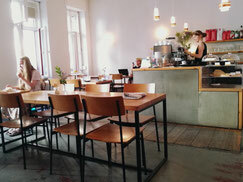 Here we are on Gabriel Max Strasse, Friedrichshain’s brunch street. And we start with Silo. If you want to taste the best coffee ever come to Silo! They have a nice selection of roasted coffee that you can also purchase at the shop. The staff is really friendly and nice and speak English. The breakfast….no words for it, they have a big variety of food, organic eggs, bread, fresh fruits and vegetable, quinoa and pancakes! It worth definitely a visit. I had the rolled bread with bacon, fried organic egg, tomatoes and tomato relish and I’m still dreaming about that relish. I went on a Tuesday at 10 am and the place was packed, so make sure you have ample time when you go. What can I say about Aprilkind? Are you looking for coffee? Breakfast? Brunch? Lunch? Ok, I will stop with the annoying questions, as you probably have already understood is that Aprilkind is not only a cafè, but also a place to eat, drink, work if you are a free lancer, meet your friends for a nice lunch or a tasty smoothie. Their best thing on the menu is the omelette with potatoes, olives and avocado slices. They also have plenty of options for vegetarians and vegans. Best drink is the strawberry fresh lemonade. Staff is extremely friendly — they will treat you like a friend. 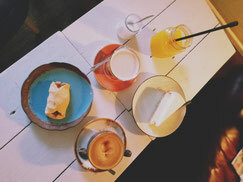 If you would ask someone who lives in Friedrichshain where to get breakfast, everybody would answer: just walk in the Gabriel-Max-Strasse and you will find the best breakfast’s places in Berlin. Neumann is one of the oldest, which doesn’t mean eventually traditional even tho you can find farmer’s breakfast prepared in the Iranian style and Strammer Max. 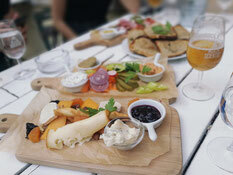 They also have their signature sandwich, covered with braised strips of fennel and warm goat cheese. 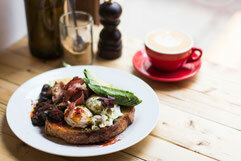 They served sweet breakfasts like muesli, amazing croissants and jam bread! The first time I went to have breakfast in this café was with a friend of mine who lived just across the street. I immediately fell in love with the sense of peace that this place offers. 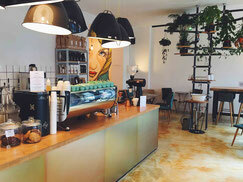 It is in a very quite and green corner and the staff is really friendly. The food and cakes are inspired by a North American kitchen and they also have a big variety of coffee. I had avocado toast and a flat white and was delicious. I can’t recommend it enough! My lovely co-author – Carmela was born in Sicily 34 years ago. She moved out from her tiny village at the age of 20 and lived in Italy and around Europe. She considered herself a nomadic until she decided to move to Berlin seven years ago. When she does not buy a book she feels lost and even if she can’t read it all she loves to accumulate them on her reading desk and look at them like they are her next goal in life. If you would take away good food and good wine from her life she would literally die. She works in a hotel for the last two years so if you’re looking for a place where to sleep and for the best advice on Berlin give her a ring. „Dream dream my daughter“ her father used to say, and this is now her motto in life.